Throughout the building industry, when framing roof systems with a metal-plated wood trusses, a topic that is easily and repeatedly misunderstood is the use of a Flat Bottom Gable Truss installed on the wall next to Sloped Bottom Chord Truss System. Serious structural damage has occurred with this practice, and the following details this issue and suggests what needs to be done. Either the contractor / building designer / inspector does not know or, quite simply, refuses to follow the code. The reasons for not following the Building Codes in this specific area could fall into two categories: 1. Misinformed or misunderstanding of the building code regarding this area or 2. Increased labor costs for the proper wall framing and installation. The gable end frame should always match the profile of the adjacent trusses to permit installation of proper bottom chord plane restraint and bracing unless special bracing is designed to support the end wall. Using a flat bottom chord gable end frame with adjacent trusses that have sloped bottom chords is prohibited by some building codes as adequate bracing of this condition is difficult and sometimes impossible. Special end wall bracing design considerations are required by the building designer if the gable end frame profile does not match the adjacent trusses. In essence, with sloped bottom chord applications, the gable wall should be “balloon-framed” using a continuous member from the foundation to the roof slope. If a gable truss is used, the bottom chord profile must match that of the adjacent trusses, and the wall must be balloon-framed to the slope of the bottom chord. A special note to consider: In a few situations, special gable wall bracing designs can be engineered for a flat bottom chord gable truss installation adjacent to a sloping bottom chord truss system, but this framing must be engineered by the project’s design professional of record. Structural Damage: What happens when your gable truss bottom does not match the bottom profile of the adjacent trusses? When lateral forces (wind) take place on the gable wall of a roof system with mismatched bottom chords, the gable truss flat bottom chord and wall top plate are laterally unsupported, at the point where they meet, creating a hinge at their interface. 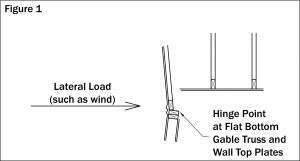 (See Figure 1 Drawing) Remember that traditionally the interior ceiling attached to the interior truss bottom chords in addition to truss bracing provide this critical lateral gable wall support at the truss to wall interface. The gable wall top plate and flat bottom chord interface must be properly braced to withstand high winds. The roof and wall’s serviceability are compromised by a “hinged” condition and can lead to wall failure or drywall cracking. In reality, this is the same structural issue that would result if a 2-story wall without an intermediate floor system were to be built with the second floor stacked on top of the first-floor framing instead of being balloon framed continuously to the full 2 story height. Responsibility: Who is responsible for using the correct design for your Gable Trusses? “Hinged” situations, which lack lateral support, simply will not work as winds approach design speeds – Wall damage will result! There are some who think that a Truss Manufacturer should take the responsibility for making sure your Gable Trusses match the profile of the adjacent trusses. However, here is the problem: Truss Manufacturers that provide Flat Bottom Gable Trusses with Sloped Bottom Chord Trusses can easily get these signed by a PE from most metal truss plate manufacturers. Why? Because these engineers are signing off only on the individual truss component based on the loading provided to them. These truss plate suppliers are not looking at the “roof system” and the gable truss and following trusses as part of this truss system. This is traditionally the responsibility of the building designer. Here at Rigidply we are consistently looking out for this situation when the information is available, and will only provide a matching sloped bottom chord gable truss. Want more information? Click here to access what Mitek has to say on this subject matter.